Your products are precious pieces of artwork. While every collection has a full background of where it comes from, every item has its own history behind it. All you want to do is to show how beautiful each and every jewellery is. The goods must be put under the spotlight where they can speak for themselves, talk to and choose the next owner. And that is exactly what we created our Jewelry BigCommerce Theme for. This is a perfect platform for you to present all of these interesting stories in the finest way for people to understand them. The stories will be so attractive that no one can turn away without getting some of it. 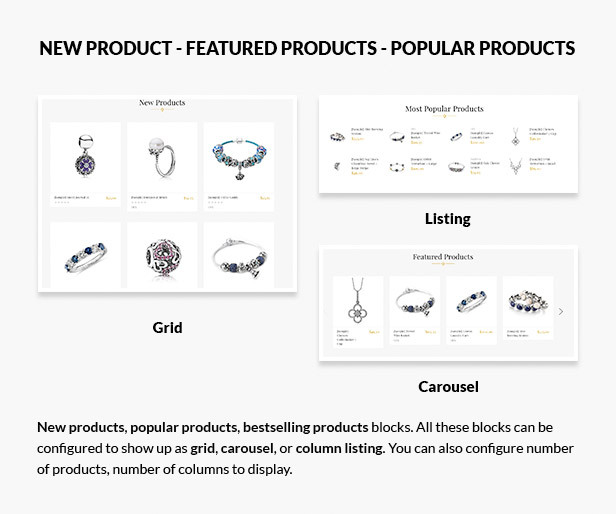 Looking at the BigCommerce Jewelry theme overview, we sense right away - "this is the one" feeling, and that is on purpose! The design brings to visitors a strong feeling of being impressed, yet not overwhelming. A bright and minimalist in details are how a background for jewellery should be. So that, focus is always on the products which are usually considerably small. However, to remain the nature of jewelry, the designer did a really good job regarding highlights of the theme. Not to show too many at a time, featured categories and products are landed gorgeously as highlights on Homepage. Let's take a closer look on how the theme was built. BigCommerce Jewelry parallax theme easily get you totally convinced why it's worthy. A beautiful ecommerce solution that grows your startup business, and so easy to use. You will need too much time and effort consumed to run your online store. 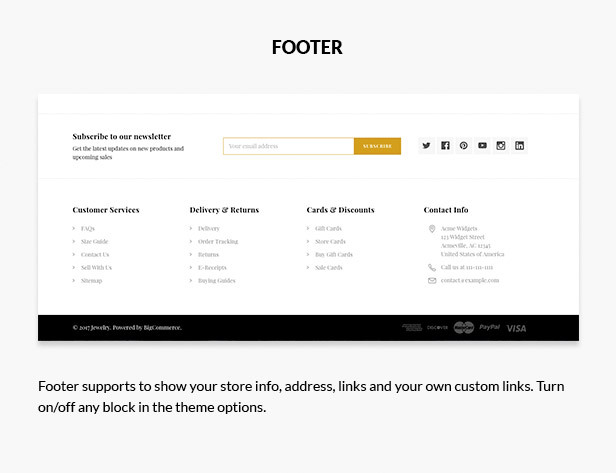 A stunning website builder that so feature-rich will drive more traffic to your shop. A fast and friendly outlook can gain best customer shopping experience. 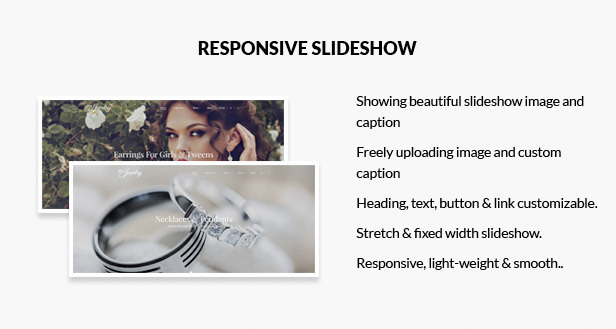 Main functionalities, such as Homepage full-screen slideshow and product widgets are fully supported. Especially, there is a built-in communication network, at most convenient. 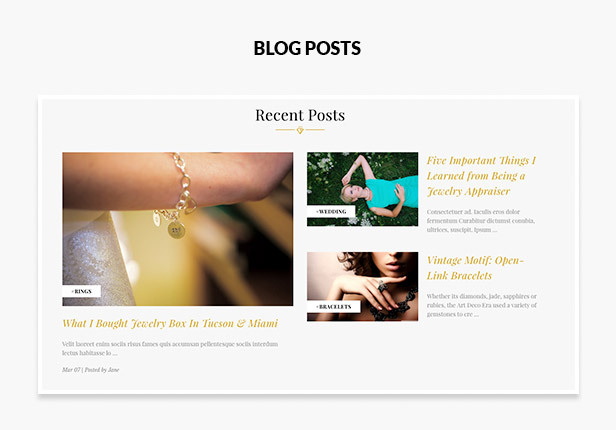 The powerful blog are integrated as inbound marketing to boost your store's sales. Most amazingly, as a BigCommerce template, Jewelry will not require a lot of maintenance or administration. You probably find this theme is everything, and more, of what you need to start with, don't wait. Jewelry BigCommerce theme has many great features and is customizable! Jewelry is tested and QC passed by the official BigCommerce technical staff. 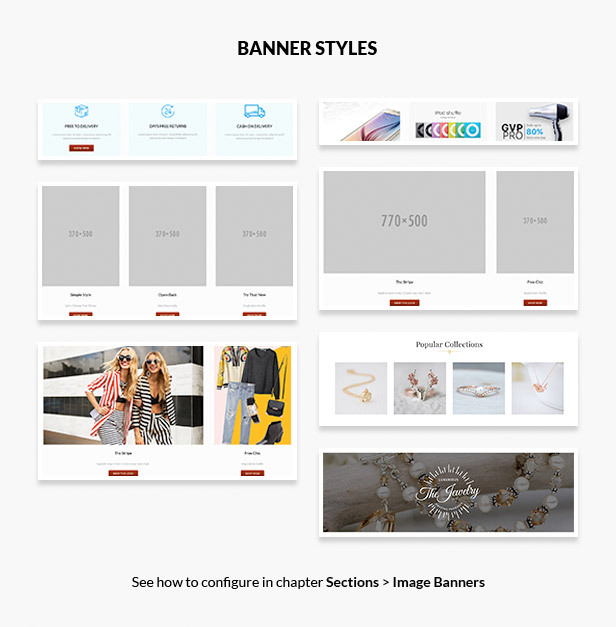 Creative banners let you show off promotions, fashion or jewelry items. Responsive and nice display on any desktop, mobile or tablets. 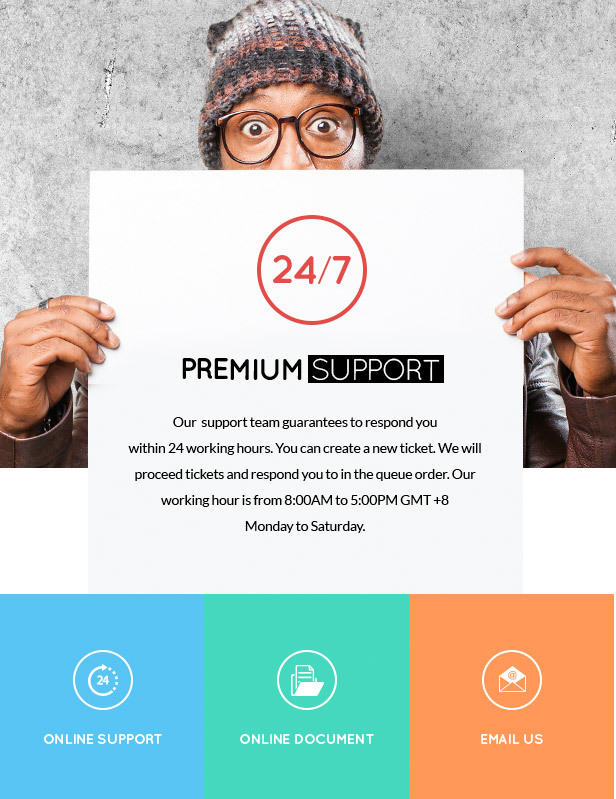 Parallax banners look creative and beautiful. New products, popular products, bestselling products blocks. 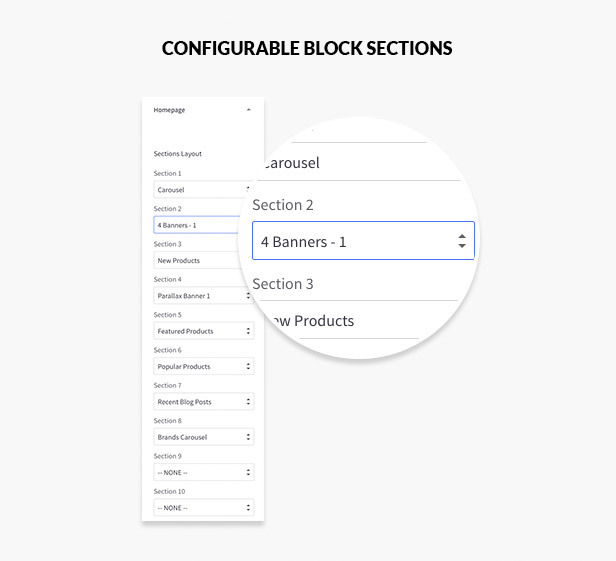 All these blocks can be configured to show up as grid, carousel, or column listing. You can also configure number of products, number of columns to display. 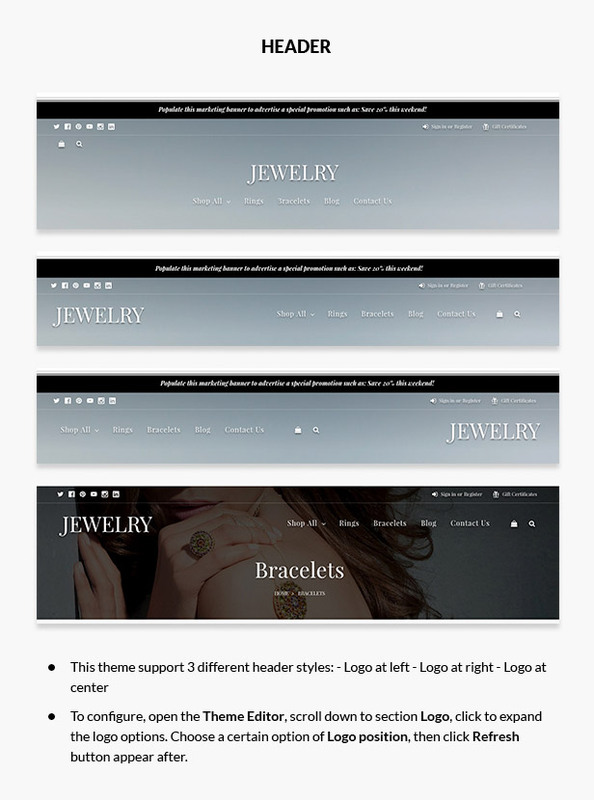 Jewelry theme supports multi-languages, multi-currencies and all other features which BigCommerce provides. The design is luxury, glorious and modern that can be used for any stores, especially jewelry stores or jewellery designers showcase. 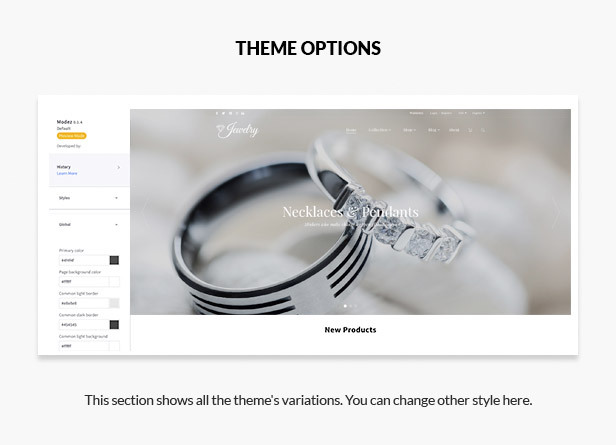 Jewelry theme has detailed user guide to help you install and customize the theme for your own purposes. This is a GREAT BigCommerce theme with very minor bugs which were quickly addressed by the developer/designer. Customer service is on point. My requests were answered and/or resolved in a timely manner. 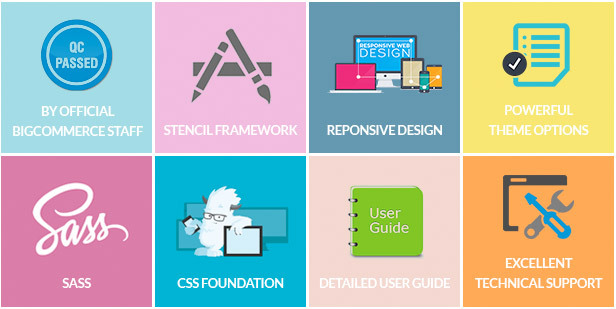 Ease of use is what I look for in a good Theme and as long as you refer to the directions you should not have an issue. I would recommend tvlgiao theme over all others. I tried two others... one was a complete waste of money and the other was just ok. Others should take note of the time and detail tvgiao takes to ensure the theme works well for the customer out of the box. I believe others rush something together and then attempt to fix later after you have wasted money purchasing. Thank you for a great BigCommerce theme! I wasn't quite sure quite what to put as the main reason for buying, as this theme seemed to tick a lot of boxes when I looked around, and also a great price too. But briefly. I'm loving this, and seems to be a whole lot better than the BigCommerce "Bedazzled" free theme I was using for a bit. 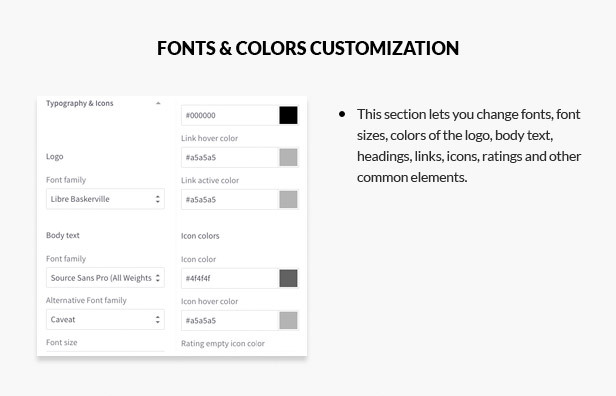 In customising it, it uses a lot of the BC customisation features you would normally use to create your own site. (you don't need to upload extra custom packs like you would on say Woocommerce (eg - Carousel). There are a few little bits you would need a look at the coding, like Footer links etc. ...I'm not into code but can add links in and so. Failing that, someone on Fiverr will happily do you a little bit of custom work for not too much money. Support ? I did run into a little issue as I had a lot of headers and some things didn't display quite right....so I sent a little email off with some pics of what was going in. They altered the coding for me and installed it on my site within 48hrs. Great job guys. Would I buy this theme again, knowing what I know now ? Absolutely. Keep up the great work. Andy. ps. Sometimes I know it can be difficult to see a site powered by a theme you want to buy, so aside from the advertising (you can ignore that bit). My site is www.OphirJewellery.co.uk.